The scandal-mired Indian coal miner Adani is a step closer to its plan to take 12.5 billion litres of water from a river in drought-stricken Queensland for a mine which would be the biggest in Australia and one of the biggest in the world. The Australian federal government has ruled that the project doesn’t need a full environmental impact assessment. Enraged evironmental groups slam the decision as "appalling and dangerous". To build and run its proposed Carmichael coal mine, Adani wants to extract water from the Suttor River in central Queensland for up to 60 years, expand a dam there and build a 60-kilometre pipeline to transport the water to its mine. Australian federal law requires that if coal mines are likely to have a significant impact on water resources, they must undergo a full environmental assessment, which would be scrutinised by an independent scientific committee. "As one of the driest continents on Earth, water is the lifeblood of inland Australia," anti-Adani campaigner at the Australian Conservation Foundation Christian Slattery said. "It is disappointing that while Queensland suffers through severe drought, the water infrastructure for Adani's massive polluting coal mine will avoid full scrutiny under Australia's national environment laws," he said. Anti-mining group Lock The Gate Alliance described the move as "appalling and dangerous". "This is another special deal for Adani that puts our water resources at risk during a terrible drought and hangs Queensland graziers and communities out to dry," spokesperson for Lock the Gate Alliance Carmel Flint said. A poll conducted for a Lock the Gate anti-mining alliance found a majority of Queensland voters wanting water rights taken off Adani and given to farmers instead. “Adani is so desperate to build their mine that they have announced a new railway plan that will halve the rail construction cost and reduce the time required to build a rail line from its proposed Carmichael Coal mine to its Abbot Point coal port. Adani will likely spend $1 billion less as a result of this new plan,” notes the Australian Marine Conservation Society. The group is asking people to demand that Aurizon reject Adani’s bid. Market Forces also wants people to “Contact Aurizon today and tell them they need to #StopAdani by denying access to the rail network”. “Aurizon is already well aware of the environmental, social, economic and reputational risks of the Carmichael mine. The company bore the brunt of community protests last year when it was actively proposing its own rail solution for opening up the Galilee Basin. Meanwhile the Queensland government has said Adani would be investigated "as a matter of priority". (Video). It took 363 days last time so we'll make sure she keeps her promise, said the Galilee Blockade, urging people to send Premier Palaszczuk a message now! “This means that both state and federal governments are investigating Adani. In the midst of a drought, they've been caught red-handed illegally sinking dewatering bores at their mine site, then lying about it to the Queensland government in their annual return. This puts the [Aboriginal] Traditional Owner's most sacred site, the Doongmabulla Springs, at serious risk. The Australian Conservation Foundation reports that Adani have broken the law by drilling into aquifers on the proposed mine site. “Drone footage appears to show that Adani has drilled six groundwater bores on the site … even though their water plans have not been approved by the Queensland state government. “While 57% of Queensland is in drought, Adani is allegedly drilling into precious aquifers, before receiving important approvals designed to protect groundwater and endangered plants and wildlife. 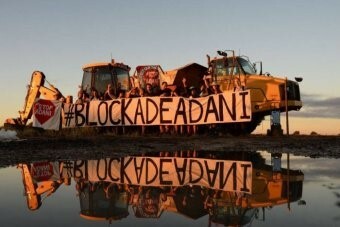 “The Queensland government has the power to immediately direct Adani to stop work. “Eastern Australia is gripped by a record-breaking drought and our farmers can’t get enough water to feed their crops and cattle. “Reports today suggest that Adani may allegedly be unlawfully accessing water, flouting the law and putting our precious water, including the Great Artesian Basin, at risk. “Adani wants to get rid of water in the ground to more easily access coal. The bores they’re drilling are called groundwater dewatering bores. Water is pumped into a dam where it is allowed to evaporate. “That’s right. Adani may be deliberately squandering water. ACF is taking these allegations extremely seriously, and we are talking directly to key political decision makers and the media. But we need to ramp up the pressure urgently on the Queensland government to immediately direct Adani to stop work. “We already know that Adani cannot be trusted. This is the second time Adani has tested our laws. “Last year, Adani was fined for dumping polluted coal water into the Great Barrier Reef World Heritage Area. And after sustained public pressure, last week the Queensland government announced they will prosecute Adani for this damage.This is a huge win! It shows that when we speak out together, we are powerful. “If allowed to proceed, Adani’s mine would drain billions of litres of groundwater at a time when Queensland farmers and wildlife suffer in a severe drought. Adani wants to dig millions of truckloads of coal out of the earth, burn the coal, release massive amounts of climate pollution into the air, which would contribute to more savage droughts, fires and floods.